The tomb of the fifth dynasty Head of Physicians of Upper and Lower Egypt, Shepseskaf-Ankh, was discovered in Abusir Necropolis - 25km from the Giza plateau, during excavation by a Czech archaeological mission. The tomb is carved in limestone and consists of a large open court, eight burial chambers for Shepseskaf and his family members, and a very distinguished huge false door engraved with the various titles and names of Shepseskaf-Ankh. Among the titles he held were, ‘The priest of god Khnum,’ who provides life, and ‘The priest of Sun temples’ for several fifth dynasty kings. Ali Al-Asfar, deputy-head of the ancient Egyptian section at the Ministry of State of Antiquities (MSA) pointed out that some of the titles engraved on the false door reflect the social status of Shepseskaf-Ankh, who came from an elite ancient Egyptian family. "Although it is the third tomb of an ancient Egyptian Physician to be found in Abusir, it has important historical and archaeological significance," said Mohamed Ibrahim, Minister of the MSA. He explains that the tomb belonged to one of the distinguished physicians who was close to the ruler kings and owned a senior official position during the reign of the pyramid-builders. 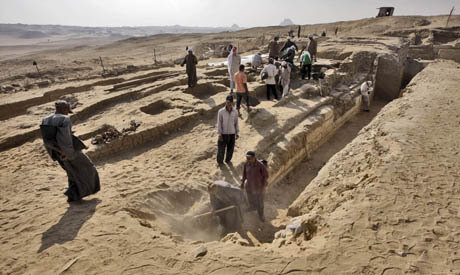 Director of the Czech mission, Miroslav Barta, stated that individual tombs in Abusir were constructed from the mid-fifth dynasty onwards, and many priests and officials who worked in the Pyramid complex during the reign of the Kings of Abusir and the Sun Temples were buried there. Abusir is an extensive Old Kingdom necropolis that served as one of the main elite cemeteries for the ancient Egyptian capital of Memphis. It houses the remains of 14 pyramids, which served as burials for the fifth dynasty kings as well as a number of tombs and sun temples. English is not a difficult language and making careful word choices, the speaker can express himself with a degree of accuracy that takes a German twice the number of words. However, the introduction of Google translate has made many people forget that translation is not the mechanical substitution of words as found in a dictionary, but instead the verbalization of thought in a different language and culture package. Now, people at Ahram English, what am i supposed to do with ....... very distinguished false door .....? Doff my hat and kowtow or just notice that it is notable?